We're the supporters group of the Colorado Rapids. If you're new to the state, or just getting involved in supporters’ culture, Centennial 38 is your guide to tickets, the biggest events around the state to get you up and close to the team, and getting you involved with the crew and the noise that make match day possible! With 3 sections in the stadium, only Centennial 38 lets you support the way to want! From ultra-loud drums and tifo to premium seating, you'll find the perfect section to call home! When the Rapids hit the road, Centennial 38 hosts unique away viewing parties in the greater Denver area. Win prizes, cheer loudly and get the best drink specials anywhere. 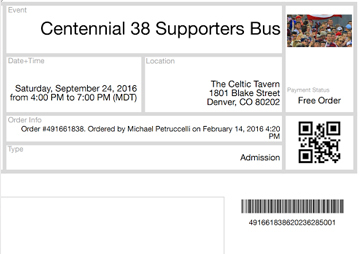 Only Centennial 38 celebrates the 20 minute drive from downtown Denver to the Rapids stadium with a party bus fully stocked with beer! Just meet us at one of our designated partner bars, show your ticket, and get safe and easy transportation to and from the game. Get informed. Get involved. Get nuts. Centennial 38 has the largest media network in the MLS. Here's how we do it. Our crack team of nerds keep you up to date with what's going on in US soccer. With full media access, Centennial 38's blog has the richest insight into the Rapids club. Since Centennial 38 is independent to the Rapids, you'll always get smart and honest reporting. Here's a few of the 1200+ members! "We're 100% volunteer driven and non-profit. While the Rapids' don't always win, the C38-sponsored tailgate has a perfect record!" "Can't beat the 3 hour tailgate before the game. Plus all the friends I've gotten over the past 5 years inside the stadium!" "We do an excellent job at bringing fans together to have a good time before the game. Then we head in together for a win!" We offer the lowest priced season tix to the Rapids. Get your Colorado rapids season tickets now. Sit back, chant, and grab a pint. Let's get to the stadium in style. Find out where the next viewing party is going to be held for drink specials and your fellow Rapids fans. Centennial 38 members get together, have fun, and go a little crazy. You can join us! We're 100% volunteer-led! If you love C38, give back and share your talents! We're the result of a grand merger of the three then-recognized supporters groups of the Colorado Rapids.